In many cases, businesses do a good job telling a portion of their STORY. This portion should not be called “telling”. It should be called “selling”. What I mean is that most businesses have dialed in their STORY about their products and services. They know the benefits and attributes of these products and they know how to sell them. They also know how to tell their STORY about their company, including history, ownership, etc. Unfortunately, this portion of the STORY is the same as all of your competitors. Its just a matter of who can tell the “same old” STORY better. Your business has a better STORY to write. This portion of the STORY focuses on the client experience that you provide. Does it really matter what you have to say about your business in your marketing? Does anyone go out and market and say “We are terrible, please come buy from us?” Of course not. All businesses market, as they should, that they are the best place to purchase their products and services. In today’s world this is simply NOT ENOUGH. What really matters is what your customers, clients, patients are saying about you and the experience they had with your business. This STORY can be written in many ways using numerous Reputation Marketing tactics. You must get honest feedback from your customers, and in the end, this is the REAL STORY that you need to write about your business. Think of this STORY that you have now developed in terms of a BOOK. It is a BOOK that tells what others are saying about your business. This BOOK is now the best marketing tool that you have. This BOOK tells those that read it why others do business with you. There is no better book that can be written! I have never heard of a great BOOK that tells a great STORY that became a BEST SELLER unless it was actually published to the reading community. Have you? Just writing your reputation story by gathering reviews and feedback should indeed give you a great STORY. The real question is what are you going to do with it? How are you going to publish that BOOK and MARKET that BOOK so that your BOOK can become a best seller? You must have a Reputation MARKETING process in place. 91% of consumers are looking online today before making a purchasing decision. 84% of consumers trust online reputation as much as personal referrals. These potential new consumers want to read your BOOK. You want them to read you BOOK! How are they going to find your BOOK? How are you going to publish your BOOK? This is why your business is like a BOOK and why you must make it a BEST SELLER. Contributed by Cary Greenberg, National Director of Sales and Operations for Digital Media Nation. Digital Media Nation is a preferred partner of MedResults Network. Their proprietary program helps businesses build a 5-star reputation to attract new clients, connects providers with their true client experience, helps them use trust to increase referrals, protects them from potential negative online reviews, and then most importantly, markets their customer experience to search results, their website, and social media channels to attract new clients. Members receive a point-of-sale discount of 25% off set-up fees and 50% off monthly subscriptions. For more information, click here. Vaginal Laxity. The Frequent Problem That’s Infrequently Addressed. This past month we recently launched a partnership with the newest device to enter the women’s health space in the USA. Although the efficacy of several women’s health devices is debatable at best, the most important aspect of these technologies lies in what manufacturers claim to treat vs. what they actually treat. We’ve done extensive research into what the most common concerns are regarding women’s health and statistics show that vaginal laxity, post-childbirth, appears to be the most frequent, yet “under-addressed” issue that women have today. As many patients won’t discuss or more than likely can’t define vaginal laxity and related symptoms, we felt it was relevant to pull an excerpt from a well-written article about vaginal laxity. Although the basis for this article is set in explaining why pelvic physiotherapy can be a great treatment addition to mitigate the effects of vaginal laxity related to child birth, it acts as a great tool to describe the symptoms of vaginal laxity and why advanced technologies may be even better options for patients seeking improvement. In this blog post Lindsay, with the help of our Pelvic Physiotherapist Katie, discusses vaginal laxity following childbirth: its prevalence, causes, risk factors, and treatment options. Click here for the full original article. Durnea C.M., Khashan A.S., Kenny L.C., Tabirca S.S., O’Reilly B.A. The role of prepregnancy pelvic floor dysfunction in postnatal pelvic morbidity in primiparous women. Int Urogynecol J. 2014;25:1363–74. Pauls R.N., Fellner A.N., Davila G.W. Vaginal laxity: a poorly understood quality of life problem; a survey of physician members of the International Urogynecological Association (IUGA). Int Urogynecol J. 2012;23:1435–1448. While some core specialists worry about losing patients to less expensive competitors, one expert sees price transparency as a benefit. As physicians pursuing cosmetic patients, we’ve become more marketing director than healthcare provider in some instances. It feels like we’re in a hamster wheel of marketing; spending money in an effort to get more traffic and more clicks to our website. So what do we have to show for it? Are you having any luck following up on those “clicks?” Probably not. Why? Because a click is just that: a nameless push of a mouse button. A click has no identifiable information. Without contact information, we’ve accomplished nothing. I moved to San Francisco a little under three years ago. I was new in town; no one knew me and I had no discernable marketing budget. I knew if I were going to build a practice in this market, I would need more than just clicks. With six other plastic surgeons in the building, I knew I needed leads that contained contact information. However, contact information from random consumers would not be adequate. I needed a lead that simultaneously gave me legitimate contact information from a qualified individual. So what makes someone qualified? They need to be a good candidate for the services I provide and they need to understand their out-of-pocket responsibility for their cosmetic procedure of choice. From a philosophical standpoint, I believe the true, ultimate pain point for any patient considering a cosmetic procedure to be that of cost and cost alone. Certainly they need to be a good candidate for the services we provide but this isn’t the 20th century where every concern was treated with surgery. If surgery was the only option, then it’s true, not everyone would be a candidate due to health or some other comorbid condition. But in the 21st century, we have so many surgical and non-surgical options that everyone is a candidate for something. Quite frankly, determining whether they’re a good candidate for a service or procedure is a moot point. If they aren’t a liposuction candidate, then they’re a candidate for non-surgical fat reduction. Or fat melting injections. If they aren’t a candidate for a neck lift, then they’re a candidate for a non-surgical energy-based lift. The pain point for these cosmetic patients is not their candidacy for a procedure, but their ability to pay. Cost is the only absolute pain point. All other pain points —time off work, preference of doctor—are relative inconveniences. So I set out to provide a service on my website that didn’t rely on clicks but rather, the consumer’s pain point: cost. With a simple digital transaction, the consumer could check pricing on my website by submitting a “wishlist” along with their contact info. They received instant gratification in the form of an automated email with a cost estimate and I received the same email with their name, email address and phone number. Legitimate contact information and a qualified lead. Check and mate! Still to this day, my office staff follows up with every single wishlist. If you’re committed to building a cosmetic practice, this follow-up time is well spent. By helping the consumer with the cost issue, you also help them make the decision of whether coming in for a consultation is a waste of their time as well as yours. Sure there are other ways for consumers to check pricing, but those usually involve US averages that may or may not include OR and anesthesia fees (the annual American Society of Plastic Surgeon’s procedural statistics don’t include OR fees that may reflect up to half of the overall cost!). The pricing estimates consumers receive elsewhere aren’t accurate or complete, and the consumer knows that. The only way to provide the consumer with accurate pricing information without tying up your office staff in tabulating one pricing request after another, is to upload all of your pricing to the cloud. That way, when the consumer submits a “wishlist” through a pricing tab on your site (see example on my site here), that pricing is automatically tabulated in the cloud and sent to the patient in an email. Again, this level of automaticity is second to none in streamlining front office processes. By providing pricing on your website, you’re giving the consumer a level of information they cannot obtain anywhere else. They can’t find your specific pricing for specific services anywhere other than your website. And when you provide that level of personalized information, consumers reward you with their contact info. Does Online Price Transparency Work? After my first year in practice in this new locale without paid marketing, I reviewed my results. I received 412 wishlists from 208 consumers. Of those 208 consumers, 17.8 percent came in for a consultation. While it’s easy to focus on the 82.2 percent that did not come in for a consultation, that’s not a loss. I still received the contact information for those consumers who submitted wishlists and who also determined my fees were out of their budget. With their email address added to my database, I still had the option of reaching them with 12 “touch points” over the subsequent year with each of my monthly e-newsletters. Of the 17.8 percent that came in for a consultation, 62 percent of those patients booked. When compared to patients that came in for a consultation that were not price-aware, the price-aware patients were 41 percent more likely to book a procedure. This shows the effectiveness of online price transparency combined with lead generation, even in the absence of paid marketing. What happened when I committed a marketing budget to my price transparency efforts? During my second year, I began paying for two channels of marketing: TV and print. By specifically promoting that I had pricing information on my website, consumers flocked to my site and started submitting wishlists to check pricing. They received price quotes and I received their contact info…to the tune of 4,156 wishlists from 2,134 consumers! Interestingly, the price-aware consumers that subsequently came in for a consultation booked a procedure 75 percent of the time as opposed to 62.2 percent of the time during the first year, prior to my paid marketing efforts. One last statistically significant nugget: Because of my lead collection in my first year, I found that 2.8 percent of those that submitted a wishlist in the first year didn’t come in until the second year I was in practice. Maybe it was because of my monthly e-newsletters or paid marketing during that second year. Regardless, all 100 percent of those that submitted a wishlist in the first year and came in for a consultation in a delayed fashion, booked surgery. Now those are the committed, serious qualified leads I’m looking for! Is online price transparency for you? It only works if done in the right way. That means that consumers only get pricing after submitting their contact info. A simple menu of procedures and prices on your site just won’t do. By combining lead generation with price transparency, you can build an email database of patients that are interested in your services when their budget intersects with the services you provide. After all, I built my database from 200 email addresses to over 5,000 in three years! To set up your free account on MedResults Network’s newest partner BuildMyBod Health, founded by Dr. Jonathan Kaplan, CLICK HERE. After signing up, enter promo code MRN on the Subscription Plan page to take advantage of your exclusive MedResults Network 10% discount after logging into BuildMyBod Health Provider Portal. Gift cards have a lot of power – they’ve proven to help businesses increase average spend and attract new customers. Gift cards are a mainstay in Retail environments – but today even service driven businesses like Med Spas, plastic surgeons and physicians are utilizing gift cards in creative ways to help them advertise new products, increase profit margins and revenues. The first thing you will need to do is determine exactly what consumer behavior you are looking to drive. Do you need to draw clients to a specific product line? Do you want to encourage existing clients to purchase additional services? Once you understand what the goal is, you can design a gift card promotion geared toward achieving your objectives. 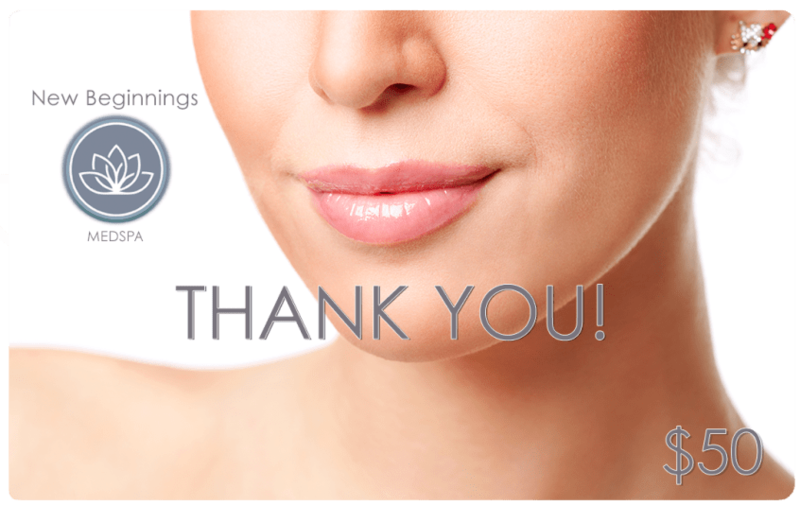 Let’s say you would like clients to know that your practice has just added Restylane™ Silk to your line of injectables. Gift cards act as miniature bill boards that can help you market a new line of products. Try purchasing a set of custom gift cards pre-loaded with funds that clients can redeem toward a specific product. Restylane™ Silk is now available! 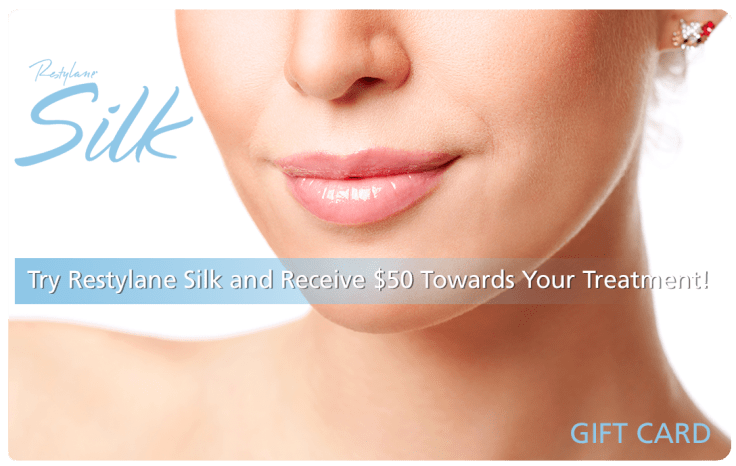 Try Restylane™ Silk in the month of January and receive $50 toward your treatment! Best Practices: To get the most out of this promotion, ensure the value of the gift card is enough to gain interest. If the average treatment will cost $800, gift cards with a $10 value will most likely not achieve a high redemption rate. Also, make sure the offer is available for a limited time only and think about any other restrictions you’d like to document on the back of the card – but remember – too many restrictions can affect redemption negatively. You can also use this program to provide incentives for clients to switch their brand of injectable for another that has a higher profit margin! It is far less expensive for a practice to generate revenue from their existing clientele, then to acquire new clientele. You may have a list of patients that come in quarterly for their Botox™ injections. But Botox is Botox, how do you ensure your clients don’t leave you for another practice? Try rewarding them with a gift card after a predetermined number of visits. Sample Marketing Tactic: Pull a list of clients that have had repeat visits for the same treatment. Send an email or letter explaining that your practice offers a VIP program and after the 5th consecutive treatment, patients receive a $50 gift card redeemable toward their next treatment. This promotion creates loyalty and drives repeat visits. Best Practice: Custom cards can be costly depending on the design. Did you know that many gift cards can also serve as loyalty cards? This means that if you should choose to run a full-fledged loyalty program, you do not have to purchase additional cards. When choosing a gift card provider, ask if they also provide loyalty programs and if the cards are “combo” cards. In some cases, you can start out with a gift card program and add on a loyalty program when you are ready! Gift card incentives are a great way to encourage clientele to try a new service. If your clients are already satisfied with how a product works on their face, why not foster the same results on another part of the body? Gift cards can make the decision to try something new a little easier. Sample Marketing Tactic: Perhaps after a treatment, a client expresses how much better they feel or how much younger they look. A physician or receptionist may reply by saying, “did you know that injectables can also be used to reduce the look of cellulite? 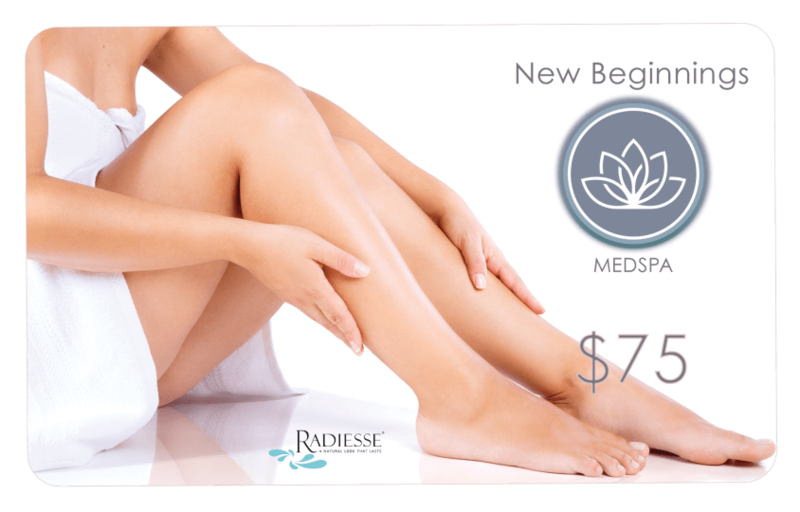 In the month of March, patients who try Radiesse™ injections to treat cellulite receive $75 off their first treatment!” Receptionists can reinforce the program by providing clients with a flyer, postcard or brochure advertising the product and program. Best Practices: The last impression you make with a client is paramount – will your client leave merely satisfied – or – surprised and delighted? If your patients leave your practice happy, they will most likely return and recommend your practice to others. Knowledge is powerful. In any promotional endeavor, make sure your staff is properly trained. Appropriate training will allow for good communication with your clients and education of your staff. Provide sample scripts so staff knows what to say and how to say it. Have them role pay different customer scenarios. Always close the circle by ensuring their gift card redemption process is just as smooth as the issuance. If there are restrictions, patients should understand them when the card is issued and not be surprised by them when they come in to redeem. Thank the client for participating and make sure they are aware of future promotional opportunities. Your clients not only want to look better, they want to feel better too. So when launching your first gift card campaign, remember that a core function of your business is to make sure your patients know you value their business and appreciate their loyalty – and that is what truly drives success! Is Wine Good or Bad For Your Skin? Will a glass a day keep the dermatologist away? We all know that answer is no. But it could help prevent some free radical damage on your skin, when taken in moderation. With this being the season to say “cheers,” and with the benefits of wine – from lowering the risk of heart disease to losing weight – getting so much press these days, we’re going to dispel the myths and look at the pros and cons of wine for your skin. And if you’re thinking this is going to support your rose’ obsession, sorry! The most beneficial wine for skin is red wines. So, put down your chardonnay and pick up your cabernet to experience these skin benefits. Preliminary research out of the University of Barcelona found that proanthocyanidins, antioxidants found in red grapes, may help prevent oxidative reactions in the skin. Oxidative reactions often stem from sun exposure and can result in damage to cells, which can lead to sunburns, wrinkles and even skin cancer. Red wines, particularly organic red wines, are packed with antioxidants like flavonoid, resveratrol and tannin. They help fight free radical damage and aging by restoring collagen and elastin fibers, plumping up wrinkles and tightening sagging skin. In addition to fighting free radicals, resveratrol boosts the effects of naturally occurring antioxidants, resulting in a calmer, less stressed complexion. Resveratrol even keeps mitochondria (a cell’s energy powerhouse) functioning normally, which, in turn, helps to slow the aging process. Drinking red wine stimulates the development of new cells in the skin’s outer layers. Drinking wine also improves skin hydration to make it look younger, supple and glowing. Alcohol is a hepatotoxin, meaning specifically that it damages the liver. The liver detoxifies your body. So, therefore, wine can be a toxin to the cells that are there to help detoxify your body. All alcohol dehydrates the skin, resulting in more sallow and uneven skin tone and texture. So, as with most things in life, moderation is the key. Before you drink a whole bottle of wine at your holiday party, remember that the recommended cap on alcoholic beverages is one a day for women and two a day for men. This will help keep skin benefiting from wine, and not suffering! In case you haven’t heard of the official trending term, tech neck is the result of a person constantly bending their neck to look down at their phone or computer screen. That repetitive movement leads to sagging skin, drooping jowls, wrinkles above the collarbones, and an increase in lines and creases in the chin and neck area. Additionally, tech neck is associated with chronic headaches, shoulder and neck pain, and the early onset of arthritis. How Serious is Tech Neck? Think Tech Neck doesn’t apply to your patients (or to you)? Think again. Research has shown that the average person checks their phone about 85 times a day. And if you are between the ages of 18 and 39, that number can increase to as many as 150 times a day! Looking down at a screen can apply up to 50 pounds of pressure on bones and muscle that are only meant to handle 10 – 12 pounds. How Can We Help Patients Prevent Tech Neck? Treat the neck and check area in the same way as the face. Most people have a regular skincare routine for their face, but they often don’t for their neck and chest. Advise patients to expand their skincare practice to include their neck and chest. Or, even better, recommend a skincare routine that is specific to their neck and chest area. Neck exercises. Have patients slowly stretching their neck forward and back, and side-to-side, 3 times a day for 10 times each. To improve blood flow in the neck, have patients place their index fingers on either side of their windpipe, moving them up and down their neck about 20 times. To improve the strength of their facial muscles, have them say the alphabet out loud in a slow and exaggerated voice 5 times. Tell them to stop resting their chin on their hands. Ask patients if they rest their chin in their hands when they look at the computer? If so, advise them to stop. This leads to unnecessary stretching of the skin around the neck. Use headphones when talking on the phone. If your patients use a manual handset, they probably find themselves resting their phone between their head and shoulder when they need to reach for something or use their hands. This also creates unnecessary stretching of the skin around the neck and chin area. Advise them to incorporate yoga into your daily routine. Many yoga poses are helpful in reversing the damage of tech neck. Upward Facing Dog, Bird Dog and Cobra help to stretch overactive, tight muscles, correct spine alignment and improve posture. Get the app. Yep, there is even an app for tech neck that helps remind people to hold their phone at an ideal angle for viewing, relieving pressure on their spine and cramping their neck. Is It Too Late For Tech Neck? If your clients are already experiencing the signs of tech neck, professional aesthetic treatments and a technologically advanced at-home skincare routine can help! Stemology Skincare provides highly efficacious anti-aging formulas utilizing the latest advancements in stem cell technology. Stemology is the first and only brand to bring together both plant and stem cell technologies, along with a stem cell communicator. This “best of” approach, maximizes Stemology’s singular ability to help prevent and improve the number one cause of skin aging – the declining production of epidermal collagen and elastin cells. With Stemology, anyone can experience healthy, glowing, younger-looking skin. One more thing about Tech Neck – If you do nothing, it will get worse. So take action today, put down your phone and spend some time outside. You’ll thank us later! The United States is currently spending nearly $1 billion a year on stem cell research, indicating an understanding of the life-changing potential stem cells have in the fields of medicine, aesthetics and beyond. And recently, the National Institutes of Health (NIH) commented that overall, clinical advances using various stem cells suggest a promising future for opening a new cell therapeutic strategy in plastic surgery. Let’s take a look at what this new future holds now. The stem cell facelift is a complete non-surgical facial rejuvenation procedure that has been performed at the Plastic Surgery Center Internationale for over four years with outstanding results. The main function of the procedure is to restore both the youthful contour and shape of the face as well as improve skin quality, tightness and color irregularities caused by the aging process, sun exposure and other environmental damage. 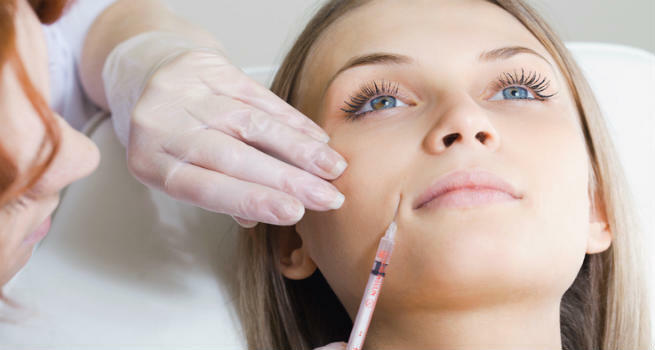 Patients who have undergone this procedure frequently avoid or markedly reduce the need for other maintenance procedures like Botox and cosmetic filler injections. The function of the procedure is based on the regenerative capacity of a group of cells called adult stem cells. Regenerative cell-based strategies, such as those encompassing the use of stem cells, hold tremendous promise for augmentation of the soft tissue space. Adult stem cells such as mesenchymal stem cells (MSCs) circumvent many of the ethical and technical issues associated with embryonic stem cells (ESCs) as they can be isolated from developed tissues including bone marrow, fat, and skin. Adult stem cells are a highly useful cell population in regenerative medicine as their ease of isolation, multilineage differentiation, and potential for autologous transplantation makes them a favorable candidate for clinical translation. According to the Aesthetics Journal, recent studies suggest that there is significant statistical improvement in skin hdyration, melanin, texture, dermal thickness and collagen by combining mirconeedling with stem cell treatments, compared to microneedling alone, The marked improvement of this combination has to do with the issue of penetration and absorption. The message molecules attach to a cell receptor and that cell makes more of the same chemical. It then excretes it between cells to signal the cells nearby and so forth, creating a cascade effect with built in amplification. Single growth factors can distort the process of tissue regeneration. Nature doesn’t apply single growth factors to a problem. They come in complex arrays (cocktails) perfectly balanced for coordinated regeneration. Stemology skincare’s proprietary technology, StemCore-3™, utilizes a three-pronged approach for optimal anti-aging results. First Stemology products contain secreted components derived from laboratory grown human Mesenchymal Stem Cells (MSC) cultures. MSC’s are very versatile (commonly called the duct tape of the body) and differentiate to create the structural tissues of the body. Second, plant stem cells are added to the formulation. And while plant stem cells cannot provide growth factors or cytokines that communicate with human cells (the “language” is not the same), the do contain specific epigenetic factors, the function of which is to maintain the self-renewal capacity of stem cells. Finally, a cell-to-cell communicator is incorporated which helps to stimulate dermal fibroblast communication with other skin cells through growth factors and cytokines. To learn more about scientific advancements in aesthetic stem cell technology, listen to the full webinar “The Roll of Stem Cells and Stem Cell Derivatives in Aesthetics,” visit http://www.medresultsnetwork.com/archivedwebinars/. For more information about Stemology skincare, visit http://www.medresultsnetwork.com/stemology-skincare/. Contributed on April 29, 2016 by Symplast, a valued partner of MedResults Network. Click Here for the original article. To learn how Symplast can improve your patient engagement through smart mobile technology, contact MedResults Network at info@medresultsnetwork.com. AND, join us for our next webinar sponsored by Symplast, Discover your patients’ aesthetic life cycle, HERE. Recently Dermascope Magazine asked Stemology’s Founder and Chief Technical Officer to write an article explaining the process of the body and skin’s nighttime renewal cycle. This article was originally printed in the September 2016 issue of Dermascope and online at Dermascope.com. Sleep is a rejuvenating time for the body, mind, and spirit. It is a necessary part of the daily cycle of living. If a person is deprived of adequate sleep time – seven to eight hours nightly – they risk additional stress and premature aging, which is reflected in the skin’s appearance. Scientific evidence supports the connection between sleep and skin aging. While the body is at rest and asleep, many of the processes that go about repairing the damage of the day are set in motion. While asleep, the body’s nervous system switches to a parasympathetic state, which creates increased circulation and oxygen flow to the skin. Because of this increased blood and oxygen flow, internal repair and production activity in the skin is heightened. During certain cycles of sleep, skin cell regeneration almost doubles. This renewal is very important in replacing the epidermal protein sloughed off during the day due to normal exfoliation. It is necessary to keeping the skin from thinning and to maintaining a youthful glow. The breakdown of collagen and hyaluronic acid in the extracellular matrix of the skin, which often occurs during the day, is replenished during sleep, when replacement production happens at a higher level. Increased collagen and hyaluronic acid production helps to keep wrinkles away and keeps the skin firmer and better hydrated. While sleeping, the body’s hydration rebalances. Because of all the regenerative activity in the skin happening during sleep, the skin will lose about 25 percent more water overnight than it does during the day. Thus, the skin can become somewhat dehydrated during the night. Other contributing factors include the lack of rehydration that occurs during the night and the increased water requirement due to renewal activity during sleep. When a person is removed from the environmental stresses of the day, the body works overtime to repair damage from the day’s pollution, sun, and stress. For the skin, this reparation means quenching free radicals by means of antioxidant activity, removing toxins absorbed in the skin, and reducing inflammation that may have increased from the day’s activities. There are two key times when human growth hormone is secreted by the pituitary gland: right after heavy physical activity and during certain sleep cycles of the night. Human growth hormone is the master hormone in preventing aging. It stimulates all of the organs of the body toward renewal, including the skin. Since it is secreted during sleep, it is obvious that the repair and renewal process of the skin, in order to fight aging, will also be at its highest activity level. Given all of this activity within the skin that occurs during sleep, it stands to reason that an anti-aging skin care regimen could capitalize on the natural objectives of the skin at the perfect time of the daily cycle of repair and renewal. Ideally, the best nighttime skin care product would be one that provides outstanding hydration by all possible means, a rich suite of antioxidants to assist with environmental damage of the day, effective and gentle exfoliation to assist in skin turnover, and growth-assisting peptides and amino acids that will help increase skin and collagen growth activity. Stemology skincare recently launched Cell Renew Hydro-Plus Overnight Moisturizer with StemCore-3. This rich overnight moisturizer is formulated to optimize the skin’s renewal process during the sleep cycle, with visible results upon waking and over time. Are More Products Really More Effective? As we know, not all products are created equal. Some products can be used in combination while others can give users a bad reaction when combined. With skincare products becoming increasingly more effective and potent, I often get asked about layering serum products. Is it safe? Is it more effective? Is there such thing as putting on “too much” product? So, today I want to discuss some of the most common questions and concerns when it comes to layering serum products. Q: Why layer serums? What’s the advantage of using 2 or more serums versus one? A: Serums often only target one specific skin concern, and people often choose a serum because they usually have a higher concentration of a needed active to address one of those specific concerns (retinol for wrinkles, for example). Some may be focused on delivering antioxidants, others on delivering retinoids, others on skin discoloration such as brown spots or sunspots, and others simply feature a special active that is popular. If you want to cover all of the bases, and enlist a more focused approach to targeting specific skin concerns, you may very well need to layer on more than just one. A few serums have actives that address multiple skin aging issues. But even so, layering can offer a more targeted approach to addressing skin concerns. Q: Is there a limit to how many serums you should use at one time? A: No, there is not. However, with that being said, the best practice would be to use a multi-purpose serum and then one to two additional serums to further address and target a particular skin concern. However, it’s important to advise clients not to apply too much of any one serum. People often apply too much thinking it will be better, which is not usually the case. A thin layer pressed into skin is best and will get the same result, without all the extra layers and the time needed to let serums dry-down or set in between applications. Q: Are there any products that should not be used together? A: Be careful about using products that have topical retinoids. There is a limit to the amount that can used before irritation begins, and that can vary based on the sensitivity of your skin. Clients might not be aware that they can be using multiple products where each contain retinoids and, even though individually they are fine, the summation can be irritating. So, always ask your clients what products they are using at home and take the opportunity to educate them on retinoids and potential skin irritation. Q: What should I advise clients to look for if they want to combine treatment products? Treatment products, such as serums, contain the most potent dose of anti-aging ingredients you can find in nonprescription products. It is really the combination of active ingredients that defines the serum – with the main six categories being antioxidants, peptides, retinol, growth factors, alpha and beta hydroxyl acids, and unique botanicals. A well-designed serum, which addresses a particular issue, will select multiple actives that are proven to help with the issue, and not just rely on a single active (e.g. such as Ferulic acid, or Vitamin C). Be sure the serums clients are using together do not perform the same function or they will end up with duplication and wasted money. Also, if the client has a tendency for oily skin and/or breakouts, be sure that combining products do not deliver too much oil to the skin, which can cause further break outs. Q: What’s the best way to apply treatment products when layering? Q: Should the serums layered be changed seasonally? If so, what combination works best for cooler fall/winter temperatures? A: Serums are usually designed to address or prevent various aging issues. One aging issue is sun exposure, which is normally much greater in the warmer seasons of the year. Adding an additional antioxidant serum or an environmental exposure product would be useful during this time of year. A good daywear sunscreen will also be full of antioxidants as well. Additionally, as summer comes to an end, often times we will experience an increase in sun induced hyperpigmentation in the way of brown spots, sunspots and uneven skin tone. This is the perfect time to add a brightening serum as a way to reduce the appearance of any brown spots that may have appeared on the skin’s surface as a result of increased sun exposure. Stemology skincare offers Cell Revive Serum Complete, which addresses all 12 signs of facial aging – including fine lines and wrinkles, skin elasticity, uneven tone, large pores, free radical damage and more – in one serum. Additionally, Stemology offers a wide range of serums targeted to specific skin concerns including Collagen Complete, Brightening Serum, Smoothing Serum and Eye Serum Complete. As the season changes, so does the skin, and therefore an updated skincare routine should be introduced. As summer turns to Fall, your clients will be enlisting your help in returning skin to its most even and brightest best! So, let’s take a look at the most common skin changes and how to help create a seamless seasonal skin transition for your clients. Sun exposure is the number one cause of skin aging. And the majority of that exposure occurs within the summer months. Unprotected sun exposure causes damage to the skin’s epidermis and dermis, resulting in an increase in unwanted pigmentation on the skin. Now that summer is fading, do the same for sunspots with a skincare regimen designed to help speed up the declining rate of skin’s cell turnover. Look for products with all-natural ingredients that are clinically proven to reduce the appearance of spots that contribute to an uneven complexion. With today’s advanced technologies, it’s never been easier to help your clients achieve a more even skin tone naturally, without harsh chemical ingredients like hydroquinone. Instead, offer products that contain AHA and BHA acids, plus natural fruit enzymes and amino acids to provide exfoliation and naturally help thicken skin and improve circulation. The weather change, combined with hormonal changes as a result of aging, reduces oil and sweat gland production, resulting in less natural oils to help lubricate skin. This process causes skin to appear (and feel) dry and dehydrated, leading to a rough, “crepey” appearance. Advise clients to incorporate a skincare regimen that hydrates in multiple ways – by attracting water, binding hydration to the skin and holding it in. Single function moisturizers that simply lay moisture on top of the skin are so outdated, and won’t fix the problem. Dry, dehydrated skin needs to be comprehensively hydrated, with all natural ingredients that nourish the skin, while attracting, binding and sealing in moisture where it can do the most good. Look for products that contain time-release hyaluronic acid to hydrate and plump skin’s appearance. As the air becomes dryer, skin loses its ability to retain water, which evaporates, leading to dryness and increased sensitivity. Surface lipids, in smaller quantities, no longer form a homogeneous barrier. And because the skin barrier no longer performs its function as effectively, it allows external aggressors and irritants (pollution, allergen particles, etc.) to penetrate deeper into the skin. Skin then becomes more vulnerable and reactive, and is more rapidly and strongly irritated. Through proper hydration and balancing the skin’s natural pH, the skin’s natural barrier can be restored to optimal health, increasing skin resiliency and reducing skin sensitivity. Recommend products rich in ingredients and emollients that support the health of your client’s skin and work to improve the skin’s barrier function, including antioxidants to help protect skin from external aggressors. As the air outside cools, it becomes dryer with a lower humidity factor. Less moisture in the air causes skin dryness and depletion of hydration. Our natural sebum oil cannot keep up with the hydration demands of the dryer climate. This can lead skin to have a more coarse texture. In order to achieve smooth skin, we need to rid the skin of dead, flaky skin on the surface. Regular exfoliation speeds up the cell turnover process, allows the body to produce more moisture, plumps skin and helps build collagen and elastin production. Look for products that contain squalane, carrot seed, meadowfoam seed and argan oils to provide regenerative support and restructuring for smoother skin and optimal cellular function. This seems like a no-brainer, but as the seasons move from summer to fall, the weather cools and our bodies no longer need to self-regulate their temperature through sweating. Though sweating is an important function for the body to maintain its proper balance, excessive sweating can lead to breakouts, irritation, and dry skin. Now that normal to excessive sweating is subsiding, its time to cleanse skin from bacteria and toxins in a gentle way, restoring skin’s pH balance and re-hydrating environmentally damaged summer skin. Use cleansers that have anti-inflammatory ingredients such as chamomile and gentle hydrators that are all-natural. The latest advances in regenerative medicine – also known as stem cell therapy – have a proven track record in addressing skin damage, from dry skin to sun damage to wrinkles. For optimal results, look for skincare products that utilize this technology and are supported by clinical studies proving their efficacy. Stemology skincare has all the products your clients need to help transition their skin from summer to fall, including Cell Revive Brightening Serum, clinically proven to reduce hyperpigmentation in as little as 14 days. * For more information about Stemology skincare, visit http://www.medresultsnetwork.com/stemology-skincare/. *Study results on file. Stemology skincare and its affiliates do not guarantee results. Results may vary. MedResults Network is excited to announce our new partnership with Symplast, a revolutionary new practice management and patient engagement platform that is fully functional on any smartphone, tablet or desktop computer. Founded by a group of plastic surgeons in 2013, Symplast is the first cloud-based, 100% mobile software that optimizes productivity, revenue and patient interaction in an aesthetic practice. Visit www.symplast.com for more info. Symplast offers a complete ecosystem of modules: HIPPA secure messaging/multimedia/video, next generation patient engagement, marketing, multimedia, inventory management, practice management, and EHR. Capture videos, images, or documents from any mobile device, and share them securely with your patients instantaneously. Intuitive workflows eliminate unnecessary menus and dropdowns, increasing the efficiency of your staff and eliminating the headaches of other, more complicated software systems. How much time and money is wasted every day in your practice with inefficient workflows and unnecessary, outdated technology. Eliminate the need for expensive cameras and printers. Increase the number of appointments you can schedule each day. As an exclusive offer to MedResults Network members, MedResults is offering a $50 Visa Gift Card to every practice that participates in a full live demo before Oct. 1, 2016. Experience how the proprietary technology of Symplast can transform your workflow, in and out of the exam room. What have you got to lose? Schedule your live Symplast demo now to take advantage of the $50 Visa Gift Card! Email info@medresultsnetwork.com to schedule your Demo today! Crow’s feet are the branching wrinkles on the outer corner of a person’s eye, which can abstractly resemble a bird’s footprint. 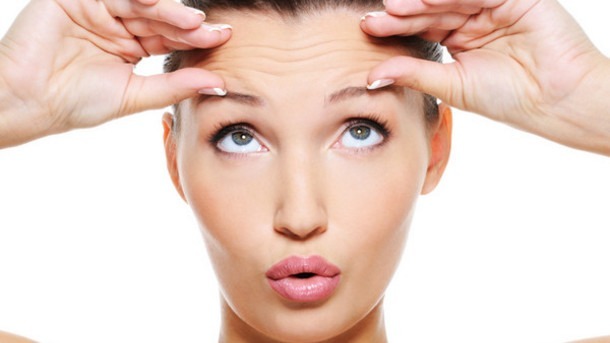 Crow’s feet become more visible than other wrinkles because the skin around the eyes is much thinner. This thinner skin does not have the same structure as the thicker skin on your face and body that helps keep those areas firm. This thinner skin has less elasticity and is therefore more prone to sagging and wrinkling. The causes of crow’s feet around the eyes are the same as what causes wrinkles on other parts of the face. As we age, the skin’s ability to produce elastin and collagen slows. Elastin and collagen are vitally important in helping to keep skin smooth, supple and resilient to wrinkles. As collagen and elastin break down, skin loses its strength and elasticity, resulting in the development of noticeable deep creases, fine lines and wrinkles, including crow’s feet. Squinting: Any habitual facial expression can eventually cause a wrinkle in the areas of the face that are involved. With squinting, the eye area is the main expression area. Smiling: Though smiling may seem like it is primarily concentrated around your mouth area, it actually can take up to 26 of the 43 muscles in the face to smile…and that includes muscles around your eyes. Sun Damage: Sun damage is the #1 cause of aging, with some citing it as the cause of 90% of skin’s visible aging. Sleeping: Habitually sleeping on your side can cause fine lines to appear where your face hits the pillow. Free Radical Damage: Free radicals, found in the environment and in sun exposure, can cause changes to your skin at a cellular level that lead to aging. Increased Salt Intake. If you have been eating a lot of salty food, it can cause skin to inflame, thin and become puffy, leading to an exaggerated appearance of fine lines including crow’s feet. Sunglasses will help prevent squinting, which in turn will help prevent crow’s feet. They also block out UV rays and help prevent photo and free radical damage in the thinner, more sensitive skin around the eye area. However, the glasses you wear must have proper UV protection. Look for glasses that specifically have a UV filter in the lens, which should be denoted by a small sticker on the glasses. Wrap-around sunglass styles offer the best protection followed by glasses with large frames. The more area the glasses cover, the more skin you will protect. Wearing sunscreen year round, with a particular concentration on the nose and around the eye area. Sun exposure has unequivocally been proven to cause wrinkles and advanced aging in skin. Find an advanced sunscreen that not only protects skin against the sun, but also helps repair skin and increase its health and strength. By wearing sunscreen everyday, you will not only reduce skin aging, but also the risk of skin cancer. Stay hydrated. Remind your clients to drink eight to 12 glasses of water a day to help flush toxins out of the body and rejuvenate your skin. What else? While smiling can definitely cause smile lines around the eyes, we absolutely recommend it. Just put prevention into practice with the solutions listed above, and you and your clinets can continue to smile and light up the world without worrying about what it might be doing to contribute to crow’s feet. *Results vary. Study results on file. The essence of younger looking skin is radiance. It’s that rosy glow that children have naturally. And the older you get, the less radiant your skin becomes. You see, attaining a brighter complexion isn’t easy. The process requires two specific steps: exfoliation to remove discoloration and melanin inhibitors to limit hyperpigmentation. Two steps to radiance – one without the other is simply not good enough. That’s why one-step lighteners and brighteners just don’t work. Natural Exfoliators: Lemon, orange and sugar are all great natural exfoliants to look for in a good brightening product. Lemon and orange are acidic which naturally exfoliates skin while sugar works manually to exfoliate as you rub the product on your face. Bonus – Because exfoliation naturally thickens skin and improves circulation, your pores will look smoother and more refined! AHA/BHA also known as Alpha Hydroxy Acid and Beta Hydroxy Acid or Salicylic acid are not only great for helping increase cell turnover, they also aid in the reduction of the appearance of fine lines and wrinkles! Each of the acids provides its own unique benefits, and when formulated properly, is an anti-aging powerhouse duo. Melanin and Tyrosinase Inhibitors: Cell turnover is one thing, but keeping cells lighter longer is the real trick. Look for melanin and tyrosinase inhibitors like vitamin C, ascorbic acid or alpha lipoic acid that reduce the look of pigmentation and help new cells start lighter and stay more radiant longer. Hydroquinone alternatives are essential ingredients in safe, natural lightening products. Hydroquinone is one of the most common – and most controversial – ingredients in skin lightening products. You’ve about the potential dangers of hydroquinone before. So make sure your lightening products do not contain hydroquinone. We always say, better safe than sorry, especially when it’s an ingredient that has been banned in most countries outside of the USA. Emollients are ingredients that soften skin and seal in moisture. Exfoliation and lightening agents can be drying to the skin. Make sure your lightening and brightening products contain emollients that rehydrate skin and prevent dehydration and further damage. Antioxidants help defend the skin against free radical damage (think sun, smoke, and pollution) that lead to dark spots and hyperpigmentation. Look for ingredients like Retinol, green tea and vitamin C, all great natural antioxidants that are good for skin. Stem Cell Technology, like Stemology’s proprietary StemCore-3, which delivers long-term results by combining human stem cells (ethically gathered from certified adult donors), plant stem cells and ingredient “helpers” to provide a highly effective hyperpigmentation reducer. Still having a hard time finding a skincare product that includes all these ingredients, try Stemology’s Cell Revive Brightening Serum. It delivers brighter, more radiant skin in just 14 days, with even more dramatic improvement after 42 days. And Cell Revive Brightening Serum is 100% hydroquinone and ubiquinone free! 5 Tips to Reduce the Work of an Aesthetic Provider! 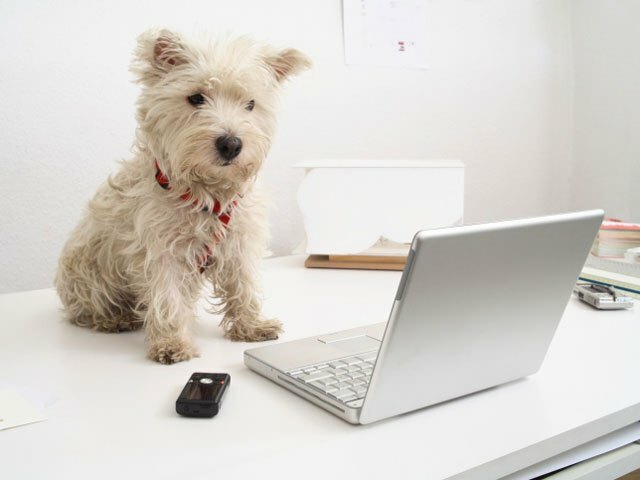 In honor of national “Work Like a Dog Day” (yes, that’s a thing) we decided it would be helpful to outline five simple ways to make your day easier so that you DON’T HAVE TO work like a dog (although we love to honor our hardest workers)! Everyone knows that in an aesthetic practice, whether you’re a very large or small practice, most employees wear many hats. As multi-tasking is common procedure for the typical aesthetic business, below are five simple ways to alleviate yourself or your staff today, tomorrow, and hopefully every day in the future. Prioritize your tasks. Define what’s most important for you to accomplish and DO IT FIRST. So often we spend the first part of our day, which should be the most productive, on remedial tasks that are easy to complete, but don’t add value to the business. These tasks may make us feel like we’ve accomplished something worthwhile when in reality, the most critical tasks are left undone. Don’t take short cuts…short cuts are never shorter. Temptation in the typical aesthetic practice may include skipping documentation & proper charting, selling a cosmetic Rx without a prescription, or sending patient information through a mobile phone or unsecured system. All of these choices may save a little time, but could eventually affect the health of a patient, your HIPAA compliance, or your overall compliance with a state board and/or state and federal regulations…all of which, will take up more time to resolve in the future. Delegate the tasks that others can do just as well (if not better). I’ve been to a number of aesthetic practices where I’ve met a physician with an outstanding team only to find out that the physician prefers to manage most aspects of the practice alone. Managing ‘marketing, purchasing, and scheduling’ is not a one-person job—nor should the key providers in a practice be doing ALL of this independently. Save yourself the time and delegate. You’ll free up your time for high-revenue treatments which makes you not only more efficient, but more profitable! Lean on groups (of similar practices) for help & advice. This doesn’t mean I expect you to become best friends with your competitor down the street. Find a buying group, an educational network, or association to keep you up to date with current treatments, best practices and cost-savings. Buying groups and GPOs (like MedResults Network) take the headache out of purchasing by negotiating for benefits on products and services so you don’t have to. Organizations like ASPS, ASAPS, ADAM, etc. offer networking and educational opportunities that you can use in your practice to improve process efficiencies. USE YOUR NETWORKS. Did you read number 4? The most common mistake I see aesthetic practices make daily, is when they sign up for a buying group or trade organization and they NEVER use the benefits available to them! Think how much time you could save by using forums to find answers to your questions, by relying on a buying group to help you secure your cost-savings from a wide range of vendors and by attending educational conferences to improve your performance. This all sounds like added work, but by incorporating each of these steps into your daily/monthly routine (and mindset), you’ll save time and money AND you’ll be operating ethically, legally, and more profitably. Do You Know Sunscreen Fact from Fiction? We all know that excessive sun exposure can be bad for our skin and our health. But, there are many myths surrounding sunscreen and sun exposure that continue to linger. According to the Skin Cancer Foundation, each year more than 3.5 million cases of skin cancer are diagnosed in the United States, and the sun’s UV rays cause more than 90% of those. Test your summer sun knowledge with our Sunscreen Fact or Fiction quiz. Fact or Fiction: Most of the skin damage we associate with aging – wrinkles, discoloration, sagging – is UV related and can be prevented. Fact! According to a recent study, up to 80% of skin aging can be blamed on UV ray exposure. Fact or Fiction: A few sunburns over a lifetime won’t hurt you. Fiction! Even one, single sunburn can increase your risk of developing melanoma, the deadliest form of skin cancer. And suffering five or more sunburns doubles your lifetime risk! Fact or Fiction: You should apply sunscreen 30 minutes before you go outside. Fact! Apply at least one ounce of sunscreen to your body at least 30 minutes prior to going outside. Then reapply every two hours, after swimming and after excessive sweating. If you are planning on being outdoors more than usual, use a water-resistant sunscreen with an SPF of 30 or higher. Fact or Fiction: If you get out of the sun when you skin starts to turn red, you should be okay. Fiction! Act quickly at the first sign of skin reddening. Get out of the sun and start treatment. Sunburns can take up to six hours for symptoms to develop. Blisters can develop hours or even days after a particularly bad sunburn. So if you’re seeing red, chances are it will only get worse. Fact or Fiction: Flu-like symptoms can be signs of sunburn. Fact! Flu-like symptoms, such as fever, chills, nausea, headache and weakness, can all be caused by sunburn. These symptoms can appear within a few hours or a few days after sunburn occurs. Fact or Fiction: There isn’t a medicine that can help your sunburn heal. Fiction! Take a dose of ibuprofen at the first sign of sunburn and keep it up for the next 48 hours. This will reduce swelling and redness, and may even prevent some long-term skin damage. Fact or Fiction: Peeling skin is your body’s way of attempting to rid itself of damaged cells. Fact! Peeling and itching are some of the last signs of sunburn and your body’s way to rid itself of sun-damaged cells. Reduce the urge to scratch and pick at skin. It will only make the healing process take longer and could permanently scar your skin. Your best strategy for saving your skin is prevention, attention and action (PAA). What are you doing to prepare for the summer sun? Tell us in the comments. Stemology is a new preferred partner of MedResults Network and Guest Blogger. Members receive discounts and rebates on their unique stem cell-based product line. I recently read a very brief, but profound article on what would happen if patients billed physicians for the time they spent WAITING at the doctor’s office. While this initially sounded absurd, the statistics about how long the average patient waits for treatment, not to mention the time they spend traveling, truly shocked me. While these statistics were generally based around ambulatory care and non-aesthetic practices, I’m certain that this happens in every type of medical practice, aesthetic or otherwise. While some medical spas are equipped to have patients wait in a comfortable lounge or secluded reception area (which takes the ‘sting’ off of waiting), the vast majority of aesthetic medical practices still require patients to wait along with those present for reimbursable consultations & treatments. While a patient may be satisfied with your care and/or the results of their treatments, the overall “waiting process” may be enough to make them consider a competitor…especially since aesthetic treatments are ‘out of pocket’ expenses. Read this insightful article by Stewart Gandolff called “What if Patients Billed Doctors for Time Waiting to Be Seen?” I think you might look at the overall patient experience a little differently. From Personal Experience: How to Do It Right! Just before Thanksgiving last year, I decided it was that time again when I should go in for my regular injectable treatment. I called my local medical spa, conveniently located nearby, and asked to schedule an appointment. I was delighted to know that I could come in as early as THAT DAY. Consequently, I booked an appointment for lunchtime and headed out. As I walked through the door, I was immediately greeted by two smiling faces who thanked me for coming in. I waited less than two minutes before the nurse came out to lead me into a treatment room. As she was new to me (not to the practice), she told me a bit about her background with the medical spa and asked me exactly what I wanted to achieve with my treatment. After sharing a laundry list of ‘improvements’ I wanted, she then gave me options as to how I could achieve that look. This is where I was really taken aback. As there are only a limited number of neuromodulators on the market, many practices will offer one that their injectors prefer and mention only that one to each patient (i.e. the patient walks in and for the most part, knows exactly what they’re getting). During my consultation, she went over all of the different types of products I could use and the benefits from each of them. Although their results are often fairly similar I thought this was a unique touch to the service she provided. Finally, she performed the treatment and walked me downstairs to check out. Once again, I was greeted with shining faces at the front desk. They asked me about if I was enrolled in a loyalty program and helped me to sign up so I could receive a savings for the treatment I had just received. Only a few days later, I received a call from the practice asking how my treatment went and if I was satisfied with the results or had any complications. The follow through was excellent! A week after that, I received a complimentary $25 gift card in the mail thanking me for coming in and rewarding me for my loyalty. Although a quick & simple treatment, my entire experience was exceptional enough for me to decide to return to that medspa for all of my future treatments. Smile like it’s going out of business—this sounds banal, but would you rather spend your money at a practice where nobody seems happy to see you…or just the opposite? Ask questions and share information—get to know the patient and let them get to know you. The more you/they know, the stronger your relationship will be (and this will keep them coming back). Post-Treatment Follow Up—this starts at the front desk and continues until that patient books another appointment with you. Do everything in your power to get them back: help them save money on each treatment through loyalty programs, thank them for their business during a follow up call, and send them a reminder (or a gift card) to keep your practice front-of-mind. The next time they think treatment, they’ll think about you. Service like this is the key to retaining a long-term and LOYAL patient base. The No-Makeup Look. This is the most anticipated trend so far, and it’s already started in 2016. Heavy contouring is out and soft, radiant skin is in. Stemology (I call it skin food!) is one of my favorites for glowing skin. There’s no amount of makeup that can make someone look good without a great base and a healthy surface. 5 Steps to Produce a Positive ROI from a New Product or Service! This past month we formed several new exciting partnerships which we’ll be launching in 2016. During all of my conversations about how to launch or introduce these technologies, products and services to our members, we’ve been confronted with the question of “How do we make our members more successful in SELLING or using these products?” Well, that’s the million dollar question isn’t it? When an aesthetic medical practice buys a device or product, their vendor should look at the SALE as only the first step of the transaction (so should the practice). Frequently, I hear members complain that they purchased a $100,000 device only to find out that the minute they signed on the dotted line, they never heard from their sales rep again. While this is unfortunately common, this is a perfect example of what a sales rep should NOT do if they want to keep that medical practice happy and earn referrals and testimonials. As a result of this ‘stunted’ sales process (as I like to call it), practices are finding that their investments are not paying off. POST-SALES SUPPORT. When considering adding a new technology, treatment or product to your practice, ask about post-sales support. If the vendor does not have an established training plan and ongoing marketing support for your practice, how can you expect to successfully integrate and promote the device to both your staff AND your patients? I can’t stress the importance of training for ALL of your staff members. Often, I speak to vendors who explain that they will train only the nurse or physician to perform a procedure…and that’s the extent of their training. This is NOT enough! Everyone in your office needs to be educated on what type of product/treatment you’re offering, how it works, what kind of results it produces and how much it costs a patient. If a patient asks anyone in your office about it, they’ll always receive an educated answer (no matter who they ask in your office). FOCUS ON THE FRONT. When we mention the importance of training all of your staff, remember that the most important way to convert patients is by having someone skilled at your front desk. If ANYONE should know about every treatment, product and procedure you offer, it is this person. Your front desk employee(s) fields calls from dozens of prospective patients on a daily basis. By ensuring that your front desk is well versed in everything you have to offer you will exponentially increase your chances of getting a patient in for a consultation. As a patient myself, there is nothing more deterring than calling a medical practice and getting an “I don’t know,” when asking about treatments. BRAND CHAMPION(S). Does your aesthetic medical practice have a ‘brand champion’ for everything you sell? I’ve often seen a practice incorporate a new service into their business only to find that while everyone knows about the new product/technology, nobody is passionate enough to talk about it. While training and education is critical for everyone in your practice (as I’ve mentioned twice now), it is just as important to find someone in your practice that is excited about the new offering and will ACTIVELY share their enthusiasm and knowledge with your patients. USE YOUR REP! A good sales rep will sell you a device and follow up to see how it’s working in your office. A GREAT rep will follow up with you regularly and assist you with converting patients and developing sales! Use your rep to host a party to promote your new product or treatment—your rep should be willing to help you do this! As with most treatments today, products and consumables represent ongoing revenue opportunities…the more you sell, the more profitable you (and your rep) become. Sales reps are business people; they know that if you’re successful, they’re successful! Take advantage of this. OUT OF SIGHT, OUT OF MIND. Have you ever wondered why some practices have a number of devices that seem to collect dust in one of their treatment rooms? If could be because there are better devices on the market. OR, it could be because the practice simply stopped ACTIVELY promoting the treatment. Placing products on a shelf in the reception area or displaying treatments in brochures at the front desk are simply NOT enough to pique a patient’s interest. This goes back to my original message—just because you added a new treatment to your offering, doesn’t mean patients are going to want it. To successfully sell a product or treatment, you have to create a paradigm shift in the minds of your patients. Ultimately, you want to create a demand for YOUR products and treatments…you want patients to ask YOU for these treatments. You can do this by continually reinforcing your new offerings at the front desk (during intake or reception) during the consultation, and in follow-up consults. You should also have a comprehensive marketing program to ensure that your entire patient base knows about your product/service portfolio. Awareness = Interest = Sales. What’s that jingle on TV? ”The More You Know…” They have a point. Limitless Customization: There are a range of new non-invasive products and techniques which provide similar and sometimes superior outcomes to surgery. Patients like to have options when determining how you’ll help them to achieve their appearance goals. If a patient tries a new product/treatment for the first time and is not satisfied with the results, a provider can refer them to a different product with very little risk. Improved technologies, products, and treatments are always emerging within the anti-aging arena. Convenience: We understand that patients are busy with kids, demanding work schedules, and social lives. As a result, we can expect that aesthetic patients will want to achieve optimal results in the least time possible, and with limited downtime! Fillers and neurotoxins offer a simple alternative to surgery. No Commitment: Today, patients research treatments and procedures more than ever, sometimes too much (cue webmd.com). They’ve discovered that the higher the risk involved with a procedure, the higher the chance of complication. As a result, patients are becoming less reluctant to commit to anything that is definite, especially where their appearance is concerned. Surgery is permanent. Non-surgical treatments generally have a finite duration which may be much more appealing to the patient that has concerns with the outcome. Overall, non-invasive alternatives give patients the opportunity to observe their results prior to making the leap to surgery. 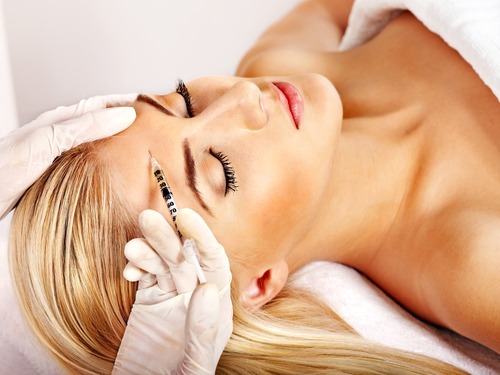 For more information on the range of injectable fillers and non-invasive treatments offered through MedResults Network partners, visit out Vendor Page. Planning an event for your aesthetic practice can be overwhelming. Besides developing a program for the event, coordinating speakers or demonstrations, and providing food, & beverages, you have to consider your overall budget and set measurable goals that will help you maximize your ROI. We’ve outlined the most important key points to assist you in planning the perfect party. 1) Identify and Define Your Goals. Are you launching a new product? Are you trying to increase your brand awareness? By defining the purpose of your event, you can begin to set measurable goals to determine whether your event produces the results you desire. It is critical to define your target audience. If your goal is to promote a new product that appeals primarily to a certain demographic, you want to be sure you don’t waste valuable resources marketing to clients/patients who will have no interest or need for the product. Consider where your event be held. While your aesthetic practice may be ideal, will it accommodate your expected number of guests? There is nothing worse than being at an event where there’s little room to move, socialize, or sit. When do you plan on having your event? Depending on your demographic, timing can be the most important piece of the event ‘puzzle’. While many people tend to be away from work on the weekends, it’s important to remember that people value their free time. Some of the most successful events can be held during the lunch hour or after office hours. 3) Make Your Marketing VERY Clear. Invites and promotions should entail the time, date, location, and most importantly a have a call to action. Advertise incentives on all your event materials. Give patients (and prospective ones) a reason to attend your event. Your vendor reps are your most valuable resource when it comes to holding an event. They are always looking for ways to help you drive business (especially if their products or services are involved)! Ask them to sponsor or support you with raffle prizes, food & beverages, and/or educational material. 5) Put On A Party! When your guests walk through the door, they must automatically feel welcome and pampered. This is the perfect time to show off your stellar customer service! Offer your guests beverages and hors d’oeuvres and make a point to collect everyone’s information as they walk through the door. Before your guests leave, send them home with a ‘goodie’ bag to show them your appreciation—this is where you can include business cards, coupons, invitations to future events and samples from your product line. Don’t forget to follow up with each attendee to send them a personalized ‘Thank You’. Never underestimate the impact of a hand-written note! While we spend the majority of our time at MedResults Network working to save our members money on the products and services they use daily, it’s sometimes easy to forget that we too, are a business that benefits greatly from cost-savings! As small business owners, we’re always looking for ways to save money on day-to-day purchases and operational needs. Below are seven simple ideas to help you cut costs in your business. The incremental value of each of these activities could save you hundreds to thousands of dollars annually! Ditch the paper and pay your office bills online; payments are instant and you’ll save time and the cost of stamps, envelopes and checks. Keep important files on your computer (regardless of whether you have hard copies) and be sure to back up your hard drive using programs such as Carbonite or Google Drive. When you’re leaving the office for the day always turn off the lights, air-conditioning, and computers. This is especially critical if you own your building! Order recycled printer cartridges; they’re less expensive and deliver the SAME results. Use the negotiating power of thousands and join a GPO or a buying network that caters to your industry. Joining others will ultimately save you tons of time (you would have spent negotiating) and cash. MedResults is one of these networks! Big businesses do it (including the government), so why shouldn’t you? Surf the internet looking for the most cost-effective products and services. It’s a good rule of thumb to shop around; I usually look for 3-5 different options to ensure that I am getting the best value. Consult with your tax consultant and ask them what you can and cannot write off. Ensure that all of your expenses are being written off properly. There are crucial tax deductions in businesses; make sure yours aren’t being overlooked. SCHOOL YOUR STAFF—THE MOST IMPORTANT TIP! 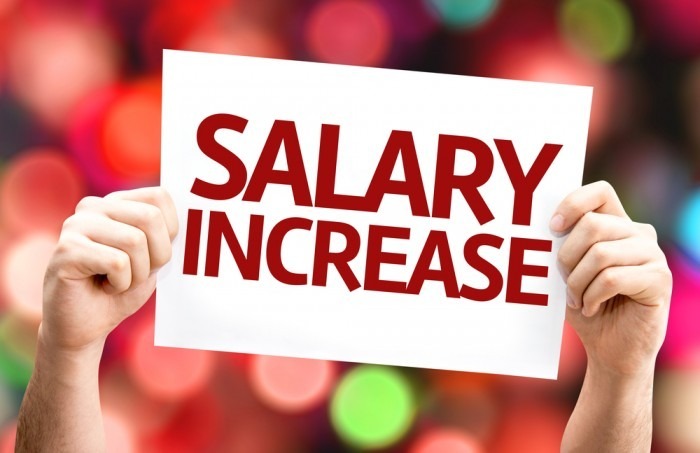 It is important to educate your staff on how to be cost effective. Just because you may be a great ‘money-manager’ doesn’t mean that they have the same knowledge or skillset. Remember that it’s easier to teach good behaviors than to change bad ones. Branding Your Website: Don’t Make These 5 Mistakes! Contact Information: The most important information EVERY BUSINESS must have on their website is how someone can reach you: your contact information. Too many times, I have visited websites that make it very difficult to find a practice’s physical location or their phone number. If a patient can’t find out how to contact you within the first 30 seconds of visiting your website, chances are, you’ll lose them as a patient! Not only should you have your contact information on both your home page and contact page, your contact information should always be extremely visible on every page either near your header or footer. 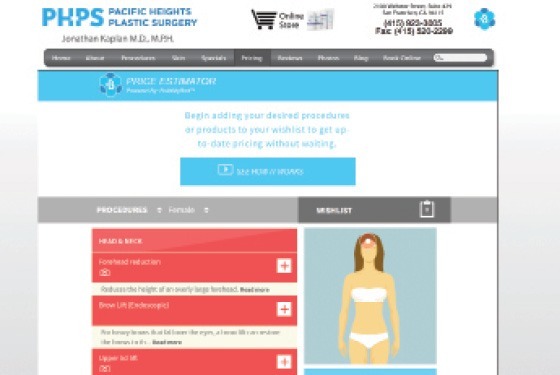 Content for Your Target Audience: I recently visited a physician’s website that was extremely clinical, in the sense that even I was slightly confused when reading about simple procedures (and I read about procedures and treatments every day). Rule of Thumb: Your content reading level has to match your audience’s reading level. Think about your audience and your language: is it “too basic” or “too difficult” for your intended audience to understand? Test your audience by using different reading levels and consult your analytics to see how engaged your viewers are with your web pages. Remember that while your patients want information, they want it in a form that’s detailed, but easy to comprehend! Physician’s Credentials: Certifications matter! Recently, I came across an article in Real Self which mentioned that prospective patients spend more time researching plastic surgery than their own weddings! I am one of these people! From my own experience: I researched more plastic surgeons than wedding venues hands down. The more information you display on your website in regards to your physician’s experience and credentials, the more credibility your practice (and your provider) will have. Prospective patients do their homework when it comes to finding the best physician for their potential surgery or treatment. Don’t Overuse Images, Video, and Text: Personally, I dislike visiting a website when the sound of someone’s voice or music starts playing; I can’t figure out where it is coming from! Give your visitors a choice to watch or listen to your content. Do not bombard your potential patients with multiple images, videos, or text on a page. Put “content limits” on your pages. Keep images to a minimum as multiple images and videos will also have an effect on the load time of your website. This isn’t the 90s—nobody needs to wait too long for a webpage to load! Clear Call to Action: When a prospective patient visits your site, where are you leading them and what do you want them to do? It is your job to direct your visitors by utilizing an effective call-to-action. Your site should answer your visitor’s question, “What’s in it for me?” without making them search for the answer. A good call-to-action should make it very clear as to what YOU want them what to do next—which in most cases is to contact you or book a treatment!